KATOWICE, Poland (AP) — Electronics salesman Leszek Jaworowski says he can’t discuss Poland’s coal mining with his father. They end up at loggerheads, just like many families in the southern mining region of Silesia. Unlike his father Edward, Jaworowski defied the area’s centuries-old tradition and didn’t become a miner. The 42-year-old believes it’s time for Poland, heavily dependent on coal, to move away from the dangerous, costly and polluting industry. But to those working in the mines, coal lies at the very core of Silesia’s identity, despite the huge safety and health hazards that it brings. Poland has chosen to host this year’s global climate summit in Silesia’s main city, Katowice. The two-week conference starting Dec.2 will see governments, scientists and activists from around the world haggle over how to implement the Paris climate accord. The 2015 agreement set a goal of keeping global warming well below 2 degrees Celsius (3.6 degrees Fahrenheit), ideally no more than 1.5 C, an effort that experts say will require sharp cuts in carbon emissions that can only be achieved by ending coal-fired power plants in the coming decades. 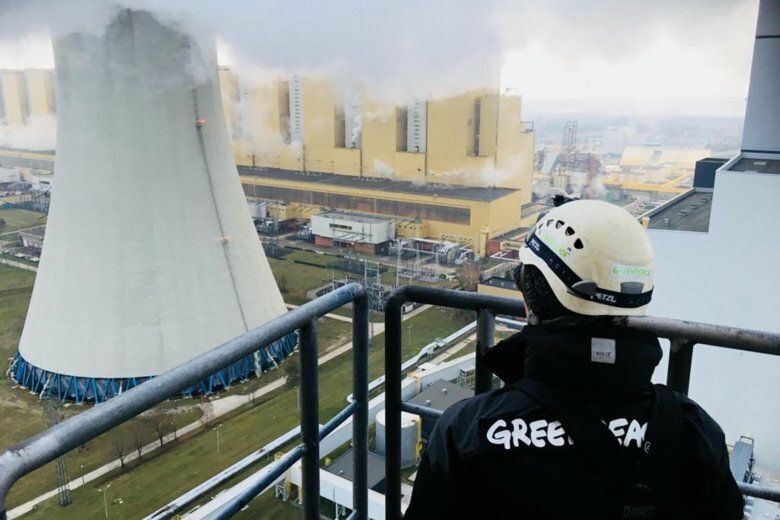 To spur the negotiators, Greenpeace activists on Tuesday climbed a 180-meter (590-foot) smokestack at Europe’s largest lignite power plant in Belchatow in central Poland. The protest aimed to stress the harmful effects that burning coal has had on the world’s climate and the pressing need to phase out the fossil fuel. Global pressure is also on other coal-burning countries like China, India, Australia, Germany, Colombia and the United States, where President Donald Trump says he is opting out of the Paris climate accord to avoid curbing industry. The Polish government argues that Katowice is a showcase for how a colliery center can be transformed into a modern, environment-friendly city. The venue is a closed mine turned into a museum and culture center. But despite the creation of a green technology hub and numerous new parks in recent years, coal’s grip on Katowice and its surroundings remains firm — as evidenced by the smog that envelops the region for much of the year. The mining industry has long been a source of pride and employment for generations of Silesians. For decades, its rich seams of hard, black coal were used to heat homes and provide electricity across Poland. At the end of Poland’s communist era almost 30 years ago, some 400,000 people were employed in 70 collieries. Miners earned twice the national average, and their feast day of Catholic St. Barbara, known as “Barborka,” was renowned across the country. Critics argue that coal’s mythical image was maintained by covering up the industry’s deadly accidents and downplaying the environmental damage caused by mining. Whole neighborhoods in some towns such as Bytom have been abandoned due to environmental concerns. From 1990, Poland’s transition to a market economy forced the closure of many heavily subsidized, unprofitable mines. Ensuing layoffs were met with violent protests by miners that prompted costly government programs that included payments for miners retiring early or moving into other fields, and financial incentives to attract foreign manufacturing firms such as German Opel carmaker. Today, about 30 mines provide jobs to some 83,000 people in Poland. Despite the retrenchment, Poland is Europe’s largest source of coal. In 2016, some 70 million tons of coal were produced, or 70 percent of the European Union’s output, according to the Energy Ministry. Still, the cutbacks have helped Poland slash its carbon emissions by 30 percent — much more than the 20 percent cut the European Union promised to achieve by the year 2020. But, like neighboring Germany, Poland cannot do without coal. Some 80 percent of Poland’s energy still comes from coal. “We, as the government, want to have Polish coal for the Polish energy system,” said Deputy Energy Minister Grzegorz Tobiszowski, who is in charge of restructuring coal mining. Consecutive Polish governments have assured miners in Silesia, home to 4 million people, that coal will remain an important energy source for decades to come. In 2040, the proportion of Poland’s energy coming from coal should decrease to 50 percent, with the rest coming from renewable and nuclear sources, Tobiszowski said. While the government concedes that coal’s role will diminish over time, Poland’s rollout of renewables — which provides about 15 percent of electricity — has stalled — partly due to legislation that protects traditional, state-owned energy companies. “It is not Poland’s fault that we have such rich deposits of fuels. The point is to use them in the most efficient way and to have them in our energy mix and to work on reducing the pollution, the emissions,” said Michal Kurtyka, a senior official at Poland’s environment ministry who will chair the climate talks in Katowice. To reduce harmful emissions, some 7.2 billion zlotys ($1.9 billion) are to be invested through 2022 into modern, cleaner coal technologies. Like the Jaworowski family, opinions on the future of coal are split largely along generational lines. To younger Poles, the prospect of going deeper and deeper underground holds little relish. The coal industry has had to hire workers from neighboring Ukraine. Patryk Bialas, an engineer and environmental activist, plans to drive home that message during the upcoming U.N. climate conference.